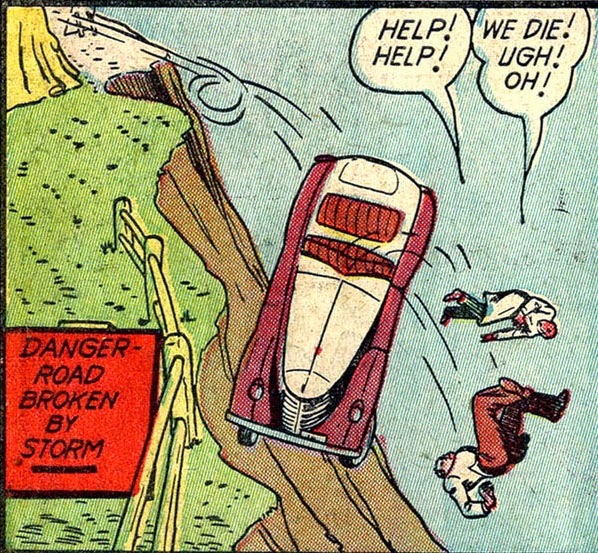 Over the dangerous cliff we go! This unfortunate circumstance we did not foresee! Condemns us with malfunctioning brake pad! Where all of the supernumerary characters go! This is the Golden Age, the super-hero season! Possibly the most inept roadside warning ever, compounded by the fact that it's pointing the wrong way. I can only wonder what it would be like to go back in time, knowing what we know now, able to draw and write the way we can now, and re-do all those old comics... properly. Cherry ride, though. They got that part right. EDIT: I see the other sign now. Still, it's not like the Highways Department couldn't afford to close off the road, you know, set up a couple of pylons, maybe, or a barrier... flags... flares... road-building equipment. Well, doo de doo, I'm just going to put these signs I painted by hand up right by the hole, that ought to be good enough, doo de doo de doo... coffee break!